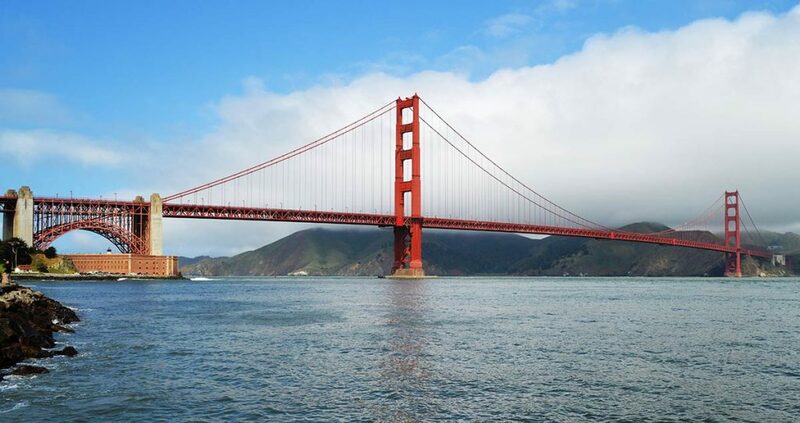 A professional or amateur’s photography portfolio is arguably incomplete without their take on the Golden Gate Bridge. 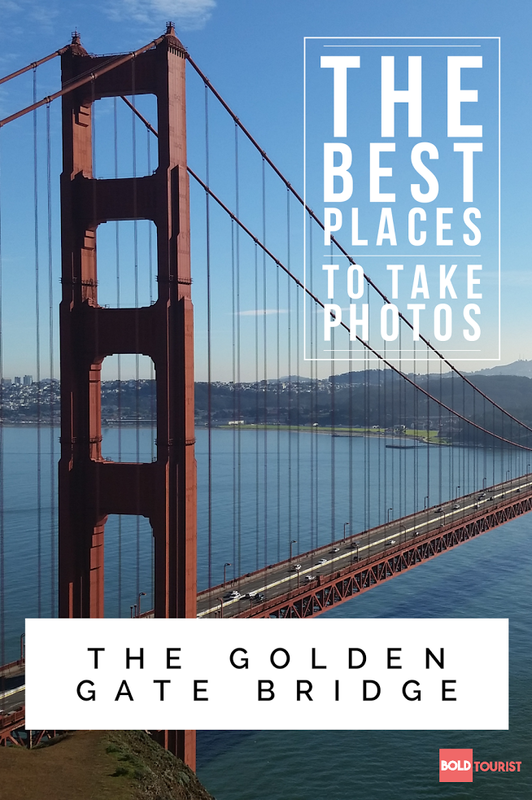 We’ve plotted out some of the best spots to take pictures of the Golden Gate Bridge, one of the most iconic structures in the world. 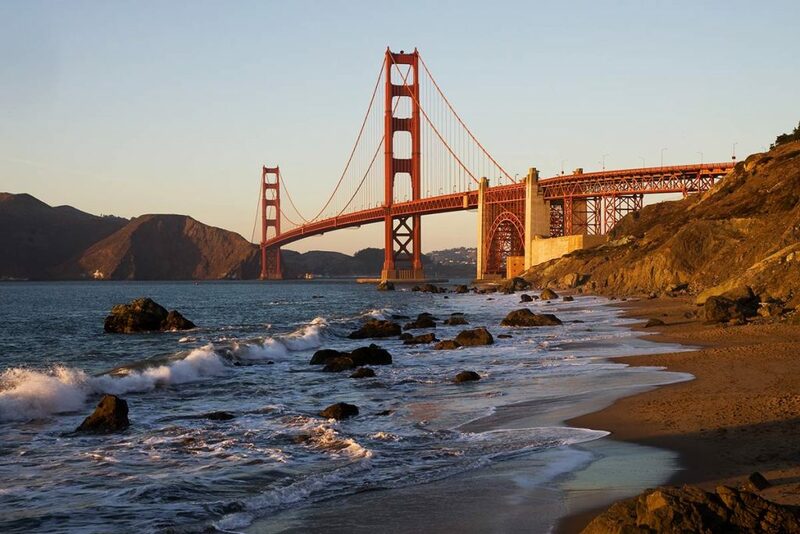 Baker Beach is one of the best spots to get sunset photos of the Bridge. 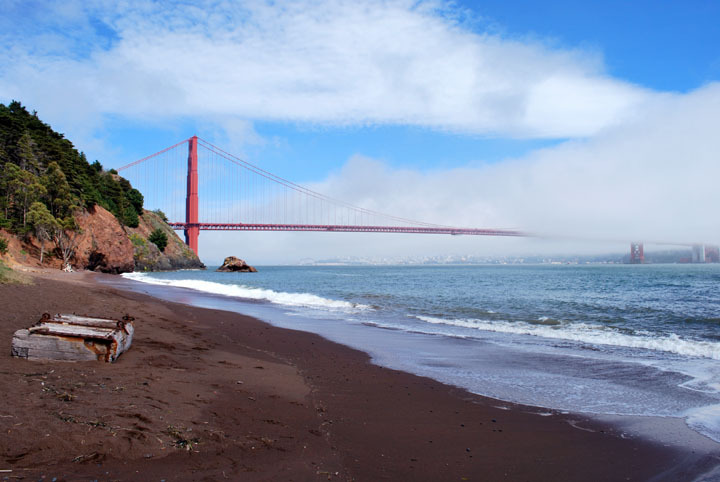 You will also have great rocky beach views and a good sightline to the Marin Headlands. This beach can get pretty popular when the weather is good. It should be noted that the very northern section of the beach is known as “clothing optional.” However, these things shouldn’t deter you from a visit for some breathtaking vacation photos. We visited with our dog and were able to get awesome pics of her enjoying the view! To get a nice shot looking straight through the bridge, head to Battery Godfrey. At the northernmost point of the parking lot is a small overlook where you can line up a nice shot looking straight through the towers of the bridge. Safer than driving and trying to line the shot up in traffic! 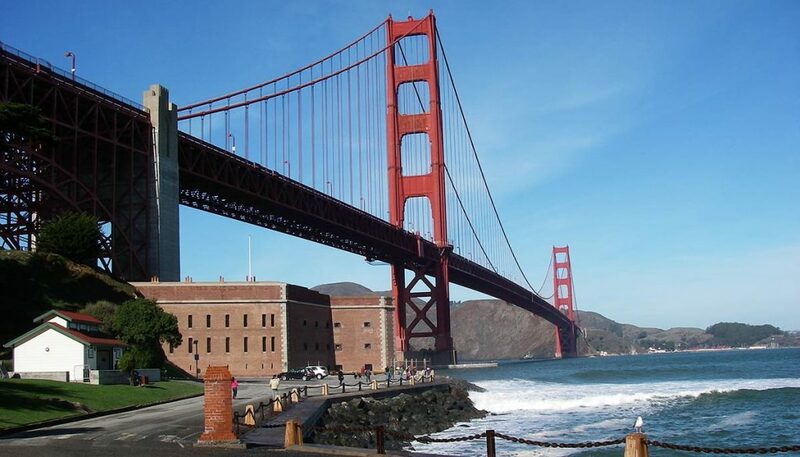 Fort Point is a great spot to tour and learn about the history, as well as get fantastic shots of the Golden Gate Bridge. 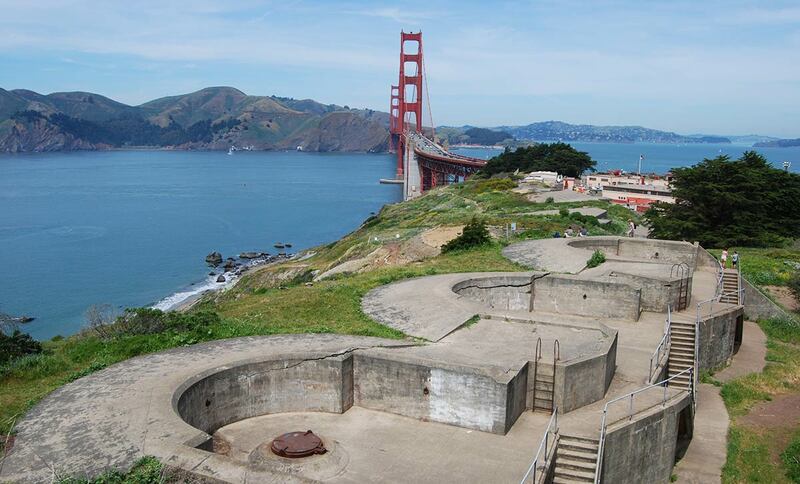 Originally built to defend the bay from hostile ships, the area is now a National Historic Site. The location is situated at sea level, under the Bridge. 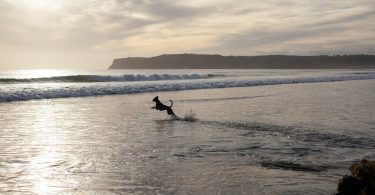 In the winter the surf gets choppy for some awesome photo ops as well. Located a bit to the east (and walking distance) of Fort Point, Torpedo Wharf will get you out onto the ocean to get a long shot of the entire bridge. 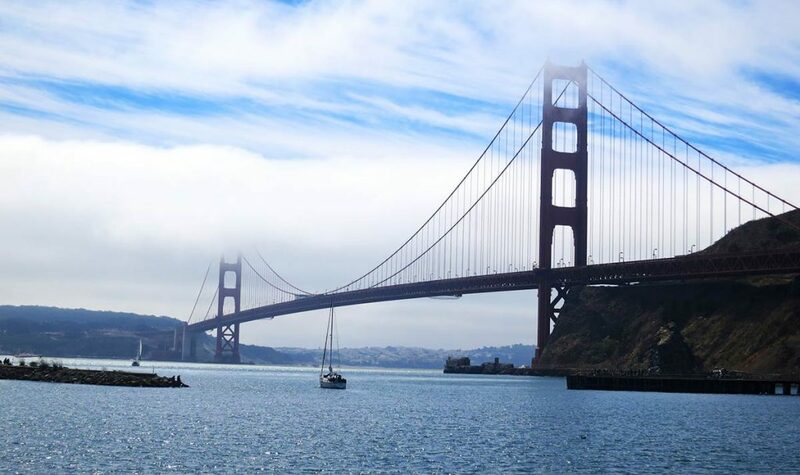 This spot would be wonderful on a foggy day, capturing the Golden Gate shooting into the clouds. It’s also recommended to continue east and get a shot with the wharf in the foreground and the Bridge in the background. 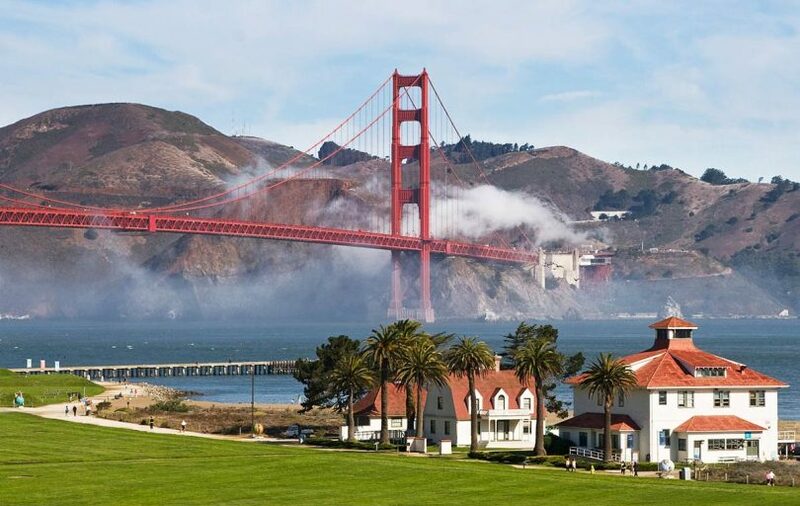 Photographers can’t visit San Francisco and miss Crissy Field. The iconic park is one of the best-known spots for a full view of the Golden Gate. A plethora of locations awaits you. On a sunny day, a foggy day, sunset or sunrise, this will be your shining moment. Also a great spot for photos of families, friends, or any other photo subjects. Fort Miley, situated on the Lands End trail, is a historic military outpost located on Point Lobos. All of the Lands End trails will offer spectacular views of the Bridge peeking out of the forest. Fort Miley itself has straight views to the Bridge. Much of the grounds have now been handed over to the VA Hospital. 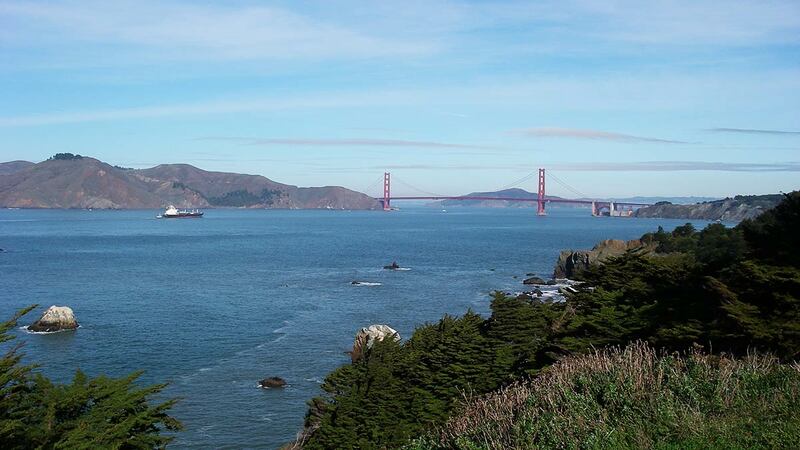 This is a wonderful starting point for taking a camera and wandering the Coastal Trails through Lands End. Plan on a bit of hiking, and stairs, if you plan to explore the area. 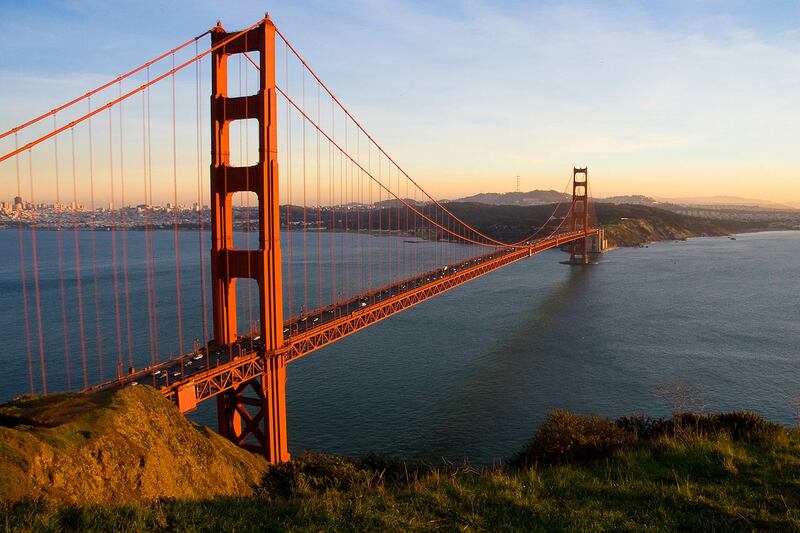 An iconic structure itself (best photographed from the Hilton San Francisco Financial District), offering seriously impressive views of downtown San Francisco, the Golden Gate Bridge, Bay Bridge, and Alcatraz Island. 360 degrees of awesome. You’ve most definitely seen photos, commercials, or movie shots taken from this spot. It’s extremely popular. To get there get off the 101 at Alexander Ave after crossing the bridge. From here, make left turns as if you’re getting back on the 101 heading south. Just before you join back to the freeway, make a right onto Conzelman Rd. The first parking lot will be for Battery Spencer, park here. It’s a short hike up to the overlook. Try to hit it on an “off” day when the crowds are smaller. 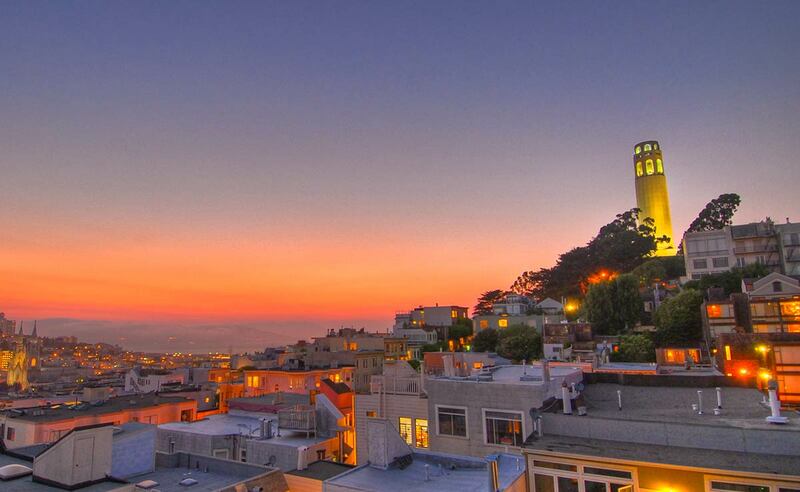 For a similar shot as Battery Godfrey, through the towers of the bridge but from the North, Vista Point is your spot! 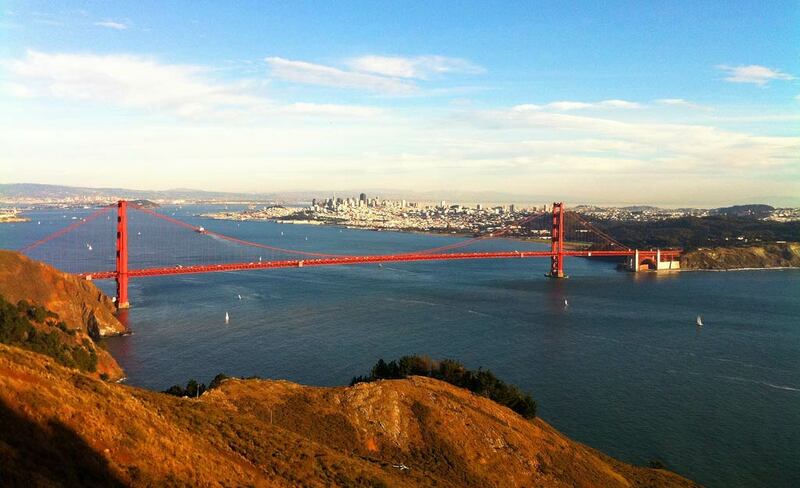 To get there, take the very first exit for Vista Point, heading north across the Golden Gate Bridge. Here you’ll find a large parking lot and a popular visitor center and ample room to find a nice angle. You do run the risk of fighting for space as this is a very popular tourist spot. It’s surprising how few “tourists” make it to this spot for a photo opportunity. 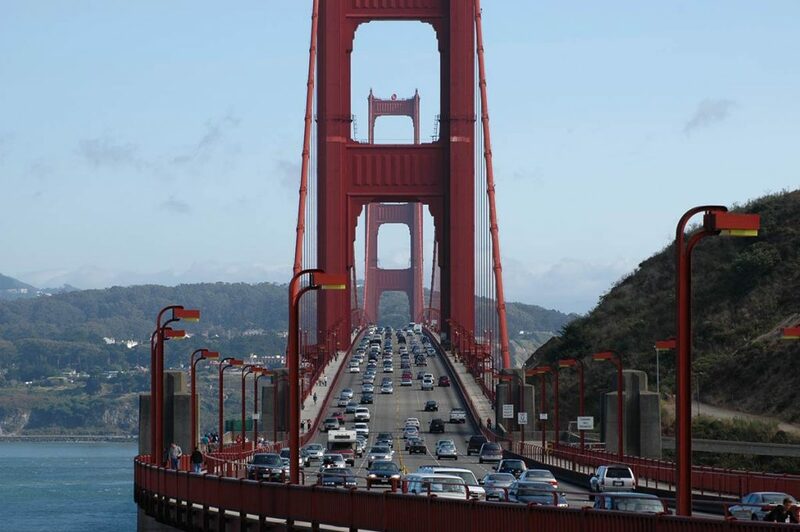 For a great close and low angle shot from the north, head towards Fort Baker on the 101 across the bridge. Get off on Alexander Ave. Make your first right onto Bunker Road, follow that down to Murray Circle and turn right onto Moore Road. From here drive all the way up until cars are restricted and park. Enjoy an awesome and unique photo spot! Hawk Hill is a great location to get a full bridge shot with downtown San Francisco in the background. 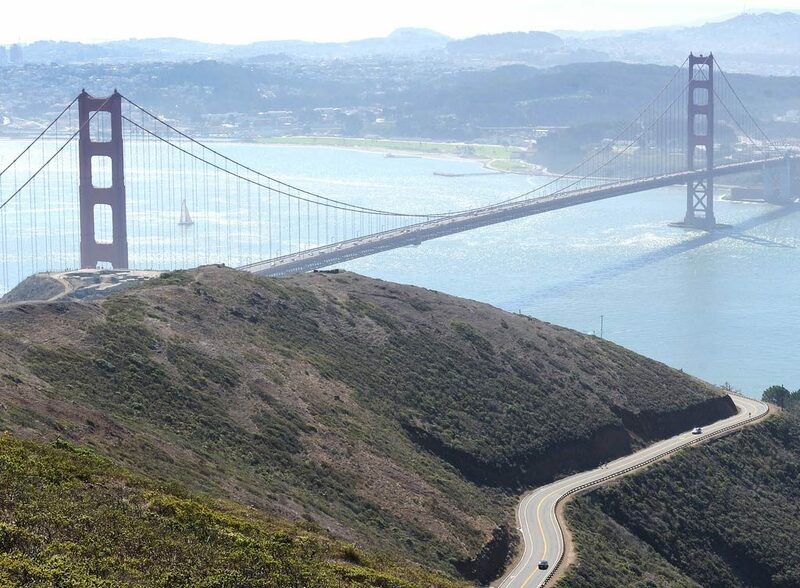 Like all of the spots we have listed on the north end of the Golden Gate Bridge, this one is accessed via Conzelman Road. Simply follow the road all the way up and park in the parking lot just before Conzelman turns into a one way road. This spot is literally just off the road, below Nike Missile Control Site SF-87. A great beach shot from the North side. To get here, park in the Battery Spencer parking lot. At the West end of the lot, you will see Kirby Cove Road, a small, one lane road that descends down. Follow this for a mile, through Kirby Campground, until you reach the beach. *This spot requires a bit of hiking. Take Conzelman Road and continue following it past the parking lot for Battery Spencer until you come to the roundabout and park in the parking lot for the Coastal Trail. Head out on the Coastal Trail heading northeast and cross the road. After you cross the road continue for roughly 1,000 feet until the trail forks, go right (southeast). 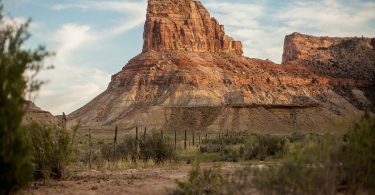 Continue on the trail until you find your ideal photo spot!